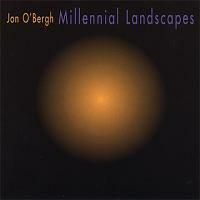 Jon O'Bergh - "Millennial Landscapes"
Jon O'Bergh is an electronic musician who on Millennial Landscapes explores, through these instrumental tracks, his thoughts of hope, apprehension, and celebration of the coming Millennium. The music consists of floating atmospheric space electronica, but does include a bit of what AI readers will consider new age fluff. The songs appear in "versions". That is, we have Apocalypse 1.0, 1.1... you get the idea. Among are stronger tracks are "Millennium 1.0" which has a nice tribal beat at the forefront with various keyboard melodies and spacey synth sounds phasing in and out throughout the song. I also liked the four "Apocalypse" tracks. By the way, O'Bergh spaces most of his "versions" between each other but I decided after a couple listens that I enjoyed listening to them together better. Anyway, the "Apocalypse" tracks explore numerous quiet atmospheres that reach varying levels of intensity. I liked version 3.0 the best for it's dark mood. There is less overtly happening instrumentally than the other three but is very much like a symphony during a quiet, but deceivingly busy passage. For the three versions of "Continental Drift", O'Bergh did group them together as a suite. Version 1.0 is an even heavier tribal piece that will bring you straight into the space jungle if you dare to close your eyes. Version 2.0 seems to have found it's way and now confidently explores the jungle environment. Version 3.0 gets more intensely tribal but are combined with more prominent keyboard melodies. The rest of the disc is similar and if I had to decide what O'Bergh's final analysis is from his various mood reflections I would conclude it is optimism for the coming millennium. O'Bergh does do a good job in his stated intention of communicating the various moods provoked by his reflections on the Millennium, and this was interesting to me given that I deal with this subject daily at work in my role as system tester and coordinator for customer testing for Y2K readiness. For more information and to hear sound files, you can visit Jon O'Bergh at his IUMA web site.